Schlage Lock Services - Phoenix Locksmith Pros - Great Rates! Your residence is probably your most valuable property. It is prudent to spend time deciding security measures just as you would in picking other home fixtures. Every homeowner desires the highest degree locks and security dimensions. Luckily, there are reliable manufacturers of deadbolts & locks such as Schlage. When it comes to locks and deadbolts, Schlage is one of the leading brands. The firm was established in San Francisco in the 1920s by Walter Schlage. At present, it is the among the trusted brands of locks, deadbolts, and other security devices. Schlage locks and deadbolts are known to be high quality and durable. They are hard to destroy, and they last for years. They are made from the best metals. They are the best protection you can get for your home as well as everyone and everything inside it. Also, Schlage deadbolts and locks can also be great for commercial buildings. Schlage deadbolt and locks can ensure the security of your office or commercial space together with the safety of all the things inside the establishment. Schlage locks and deadbolts are top quality products to guard against lock bumping, picking and kick-ins. Schlage locks and deadbolts are also available for almost any budget. The prices vary widely, so it is vital to compare prices while ensuring quality and authenticity. As a leading provider of locks and security devices, a lot of retailers and consumers trust Schlage. It will be easy to find suppliers and dealers in your area to purchase a Schlage lock, deadbolt and another type of security devices. In fact, you can just go to Schlage website to find certified retailers. It is crucial to ensure the retailer is licensed to sell Schlage products. It is a way of ensuring the locks you purchase are authentic and of high quality. There are other ways to ensure a Schlage deadbolt or lock you are about to purchase authentic. For instance, you may check if the company name is neatly stamped in the exterior of the deadbolt or door lock. The company name should also be on the latch plates, which are the metal plates surrounding lock or deadbolt. You may also find the company name on the key, above the key entry on the locks, and on the cylinder inside the lock or deadbolt. Sometimes, the code SC, followed by a number, can also be found on the locks and key. Also, some features in the handles and knobs can help you identify a counterfeit product. Schlage has become the standard in locks, deadbolts and security devices. Schlage locks or deadbolts are one of the top options for people seeking home or office security and lock devices. They are reasonably priced and offer exceptional quality. By choosing the supplier and evaluating the products, you can ensure you purchase authentic Schlage locks and deadbolts. In conclusion, the best Schlage locks can offer you the security that may be more effective than ordinary locks but cheaper than complicated home security systems. With the best deadbolt locks installed in your home, you can have the much-needed security, peace of mind and even the pocket-friendliness that you are looking for. Sleeping more soundly at night, enjoying long trips away from home and keeping your possessions close to you at home can now be yours because of the best deadbolts made available for you. 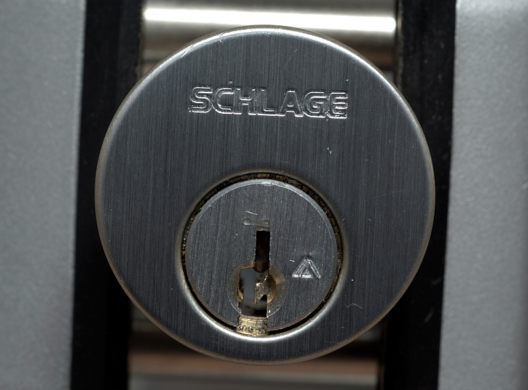 If you need Schlage locks installed, repaired, or rekeyed, call Phoenix Locksmith Pros today!